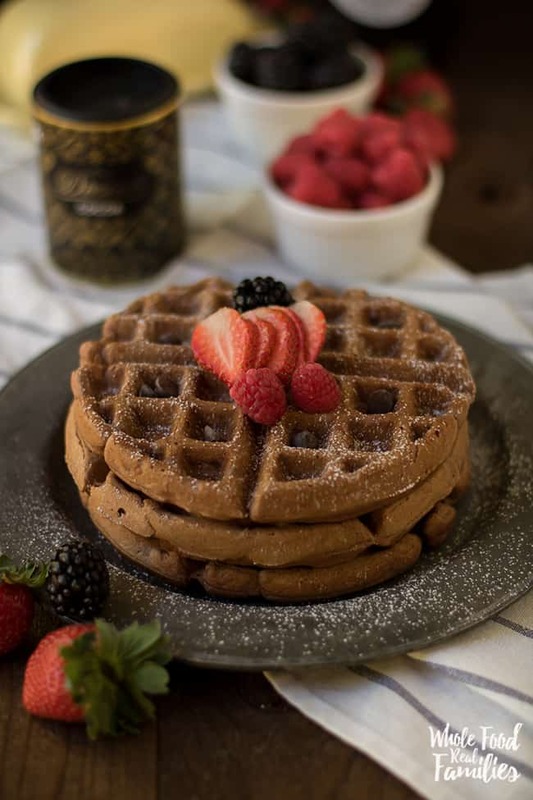 This Chocolate Waffle Recipe is rich and decadent – but still healthy enough for breakfast. 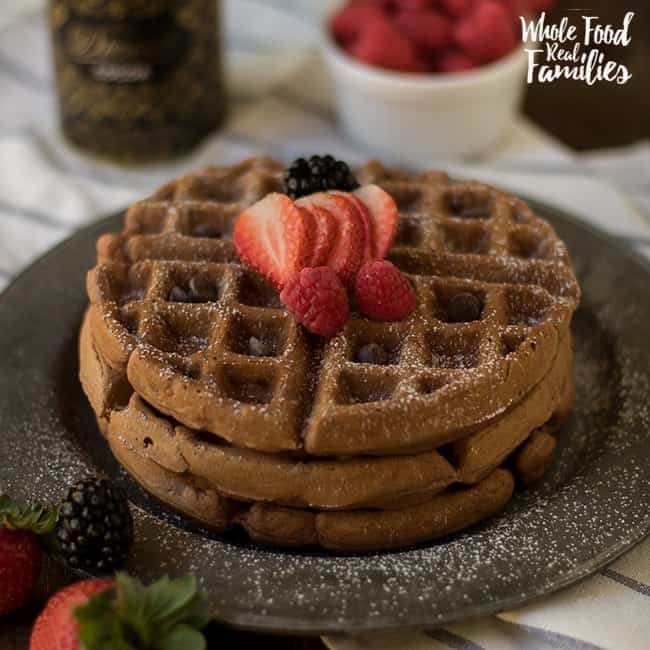 With little refined sugar and whole grains instead of refined flour, this Healthy Chocolate Waffle Recipe makes some substitutions that keep these waffles in the regular breakfast rotation! … go back to the coffee pot. It is not 6 AM yet. I should not be awake. Normal people are not awake. Who had the crazy notion that buses should run when it is still dark outside? Thank goodness I work from my house and do not have to get out of my pajamas yet. I used to be a morning person. The older I get, the less of a morning person I am. I realize that I just made myself sound older than Moses but there it is. Please tell me I still have Chocolate Waffles in the fridge leftover from the weekend. But then the weekend comes. And we have time to eat breakfast with a fork and knife. At the table. Weekends are awesome! I don’t actually have to “sleep in” to feel awesome. If I can just make it until 7 o’clock without someone waking me up, life is good. 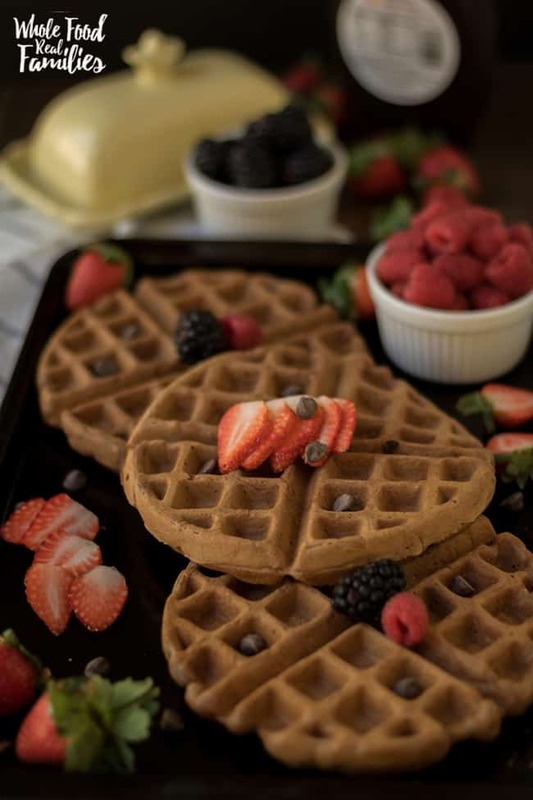 When life is good, mom busts out this Chocolate Waffle Recipe to reward everyone for their good behavior. 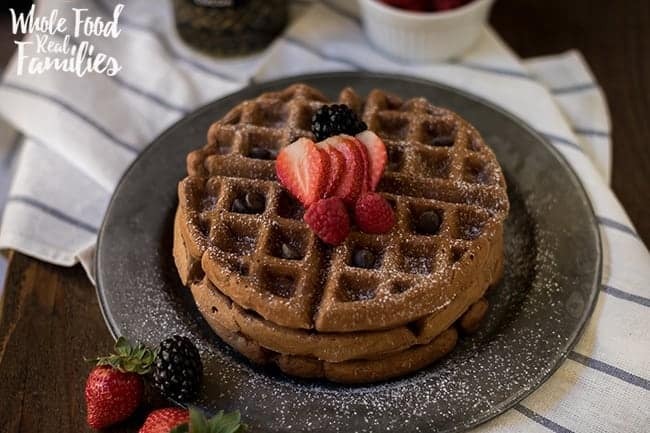 This Chocolate Waffle Recipe is a good example of why experimenting with whole grains is a great idea. While they do have a touch of refined sugar (in the melted chocolate, if you use it). this recipe keeps it to a minimum. Sometimes we forgo the chocolate chips in the batter altogether and just sprinkle a few on top. Make an extra batch (or seven) of these and stick them in the refrigerator or freezer to make a quick breakfast later in the week… You know when the kids actually want breakfast before the sun is up. Cooking around here tends to come in efficient bursts. (If you ever want to get more efficient in the kitchen, become a food blogger.) So we like recipes that can pull double duty. While this Chocolate Waffle recipe is an awesome breakfast that gets everyone running to the table. It also is the base for an amazing dessert. My job here it done. Looking for more reasons to eat chocolate for breakfast? 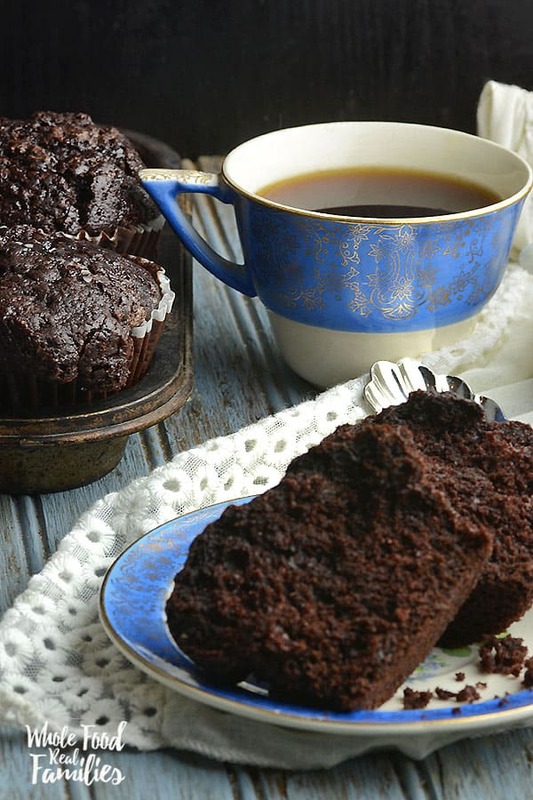 These Healthy Chocolate Muffins are one of the top recipes on this site for the last 2 years! There is a good reason! Overnight oats are the greatest early morning recipe ever!! 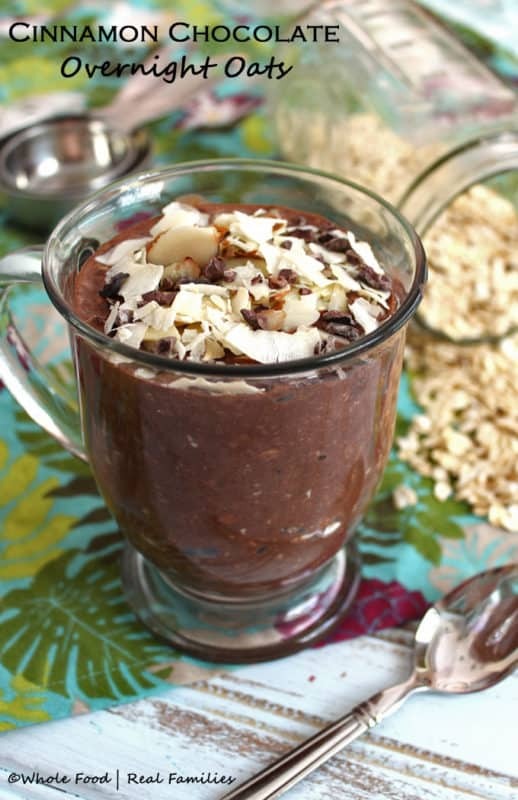 Just toss a few jars of these Cinnamon Chocolate Overnight Oats in the fridge the night before and you are all set! Shift the flour with all the dry ingredients. In a separate bowl beat the egg yolks, add the buttermilk and melted butter. Combine the liquid with the dry ingredients with a few swift strokes. Add chocolate chips if you are using them. Beat the egg whites until stiff, but not dry. And fold them into the batter. Cook them in your waffle maker, as you normally do. 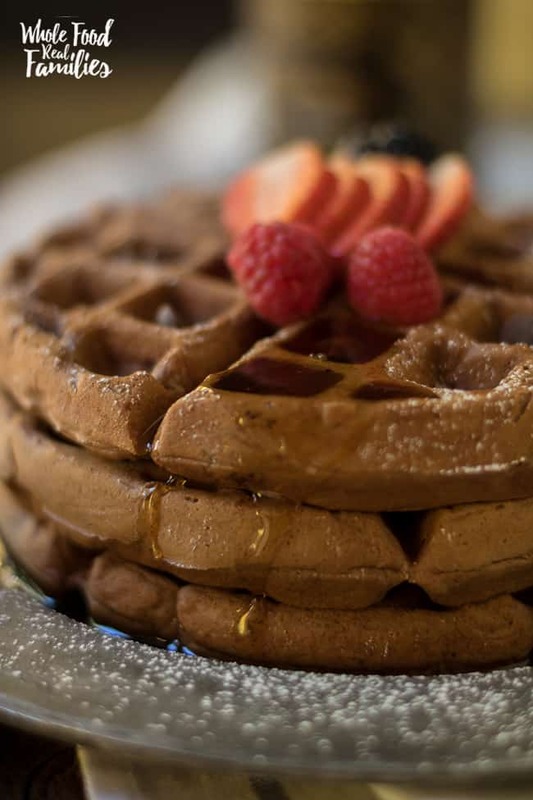 These waffles aren't super that sweet, which is a good thing. 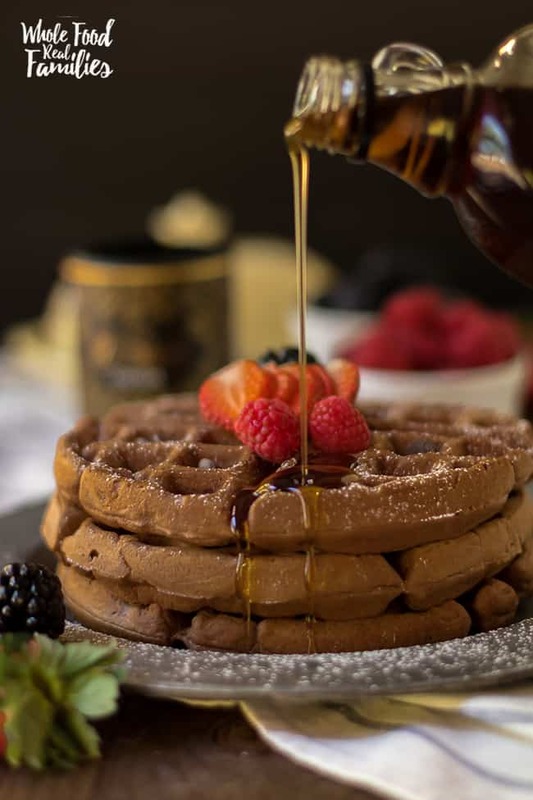 Serve with warm maple syrup and berries! Hi- my daughter has but allergies, and we even avoid coconut. What can I sub for coconut sugar? Hey Lisa. Any granulated sugar will work. If you are looking to avoid refined sugars, maple crystals are awesome!